FileRepMetagen is the PUP that uses misleading techniques to prevent removal. Use Reimage to locate malicious components and get rid of them faster than with uninstall instructions. A full system scan blocks virus reappearance and prevents traffic to malicious domains. FileRepMetagen is a potentially unwanted program that causes additional installs of questionable tools. 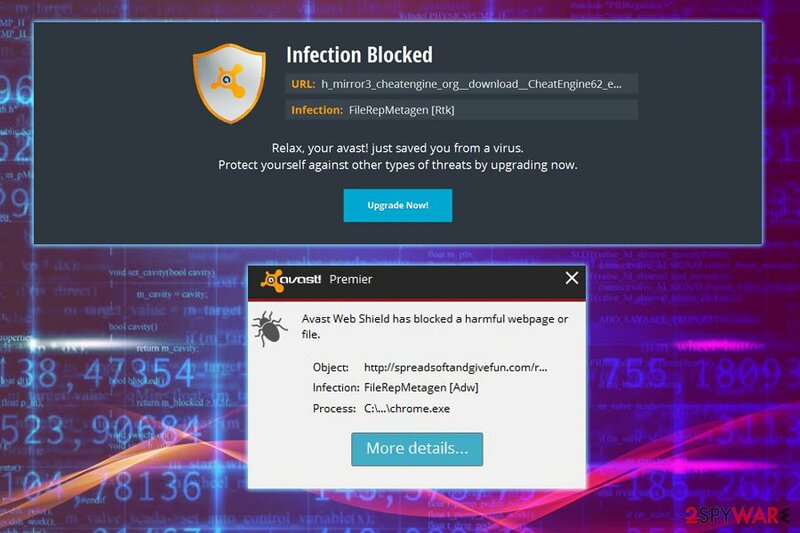 FileRepMetagen is a heuristic name used for a set of cyber threats related to multiple rogue applications by Avast Antivirus, Avast Internet Security, Avast Premier, and AVG. While the threat might be false-positive, the detection should not be ignored. The PUP represents adware-type programs, which are used to generate revenue to its developers by displaying ads, pop-ups, in-text links, video/audio ads, banners, discounts, coupons, and similar unwanted content on Google Chrome, Internet Explorer, Mozilla Firefox, or Safari browsers. FileRepMetagen “virus” is usually spread with the help of software bundling, via insecure websites, or is installed by malware already present on the device. Multiple users complained about AV vendors blocking what seemingly is a legitimate file. However, it has been associated with PUPs like Spigot toolbar and YTD downloader. Users also reported that they started receiving FileRepMetagen threat detection after downloading files from the allegedly reputable file-sharing sites like CNET, Softonic, Download.com. These domains are well-known to the broad audience, and most users think that all apps downloaded from these websites are safe. Unfortunately, it is not the case, and the mentioned sites are known to spread potentially unwanted programs like FileRepMetagen [Adv]. Another dangerous feature of FileRepMetagen virus is the installation of additional software on the device. It can include toolbars, add-ons, video recording or streaming software, program uninstallers, rogue system optimizers and similar. All these apps slow down and clutter the device, making online activity unpleasant. To take back control of your computer, uninstall FileRepMetagen [Adv] as per our instructions below. 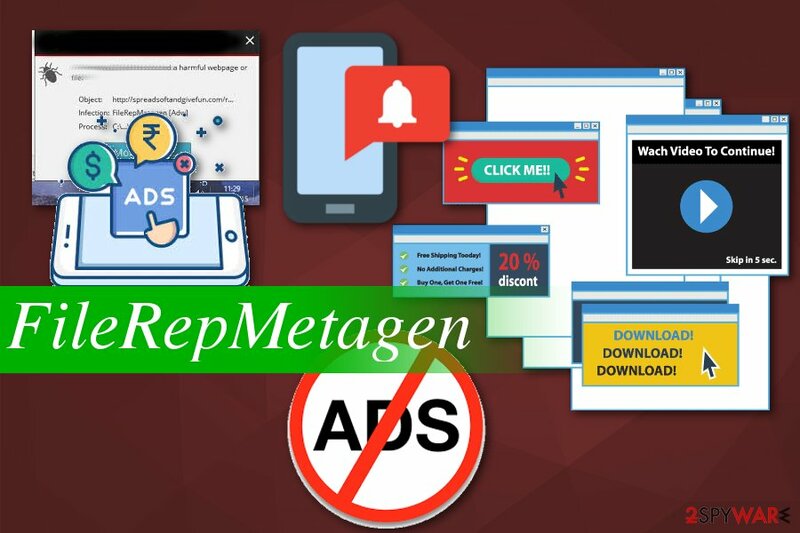 Similarly to other unwanted programs, FileRepMetagen displays advertisements that contain suspicious tool promotions and installs toolbars and other unclear applications. Additionally, it redirects online traffic to questionable sites that might include malicious content. FileRepMetagen is a program that causes tons of intrusive ads delivered to your screen and makes your browser running slow. Finally, users should be aware that FileRepMetagen adware collects non-personally identifiable information about users: IP address, geolocation, search history, links clicked, sites visited, and similar. The adware tries to access this data with a purpose of sharing it with third-party advertisers who are trying to inflate traffic to their sites. As evident, FileRepMetagen removal might not be that easy because several unwanted applications might be installed and hidden on the device (for example, uninstallation executable missing). Therefore, you can use security software to get rid of most unwanted programs. After the elimination, you can scan your device using PC repair software Reimage to revert the altered Windows Registry and similar changes performed by adware. You can also remove FileRepMetagen virus manually by checking our instructions below this article. After that, make sure you reset each of the installed browsers to make sure no redirects or pop-ups disturb you in the future. PUP authors often use several distribution methods for their products. Their primary goal is to deliver the application to as many users as possible to generate the maximum amount of revenue. Therefore, they use deceptive websites or software bundles to spread the app around. The software bundle is a product formed by PUP developers and freeware providers when they pack applications together and distribute them via p2p networks or suspicious ads and websites. Researchers advise people avoiding these services and choosing sources for application downloads more wisely. Opt for Advanced or Custom settings during installations and make sure to de-select unwanted additional pieces from the list when you are given the opportunity. Avoid Recommended or Default settings at all times, as you will not get the chance to eliminate pre-selected ticks next to undesired apps. AV engines block the threat before it manages to enter the machine. As we always mentioned, getting your software from reputable sources is crucial for a healthy device. This also goes for FileRepMetagen removal. You need to employ a reputable anti-malware program to make sure every related PUP is removed. If you think about possible damage then use PC repair tools, we have a few suggestions below. Also, when you remove FileRepMetagen remember to set your browser to default so you can eliminate any extensions, plugins or toolbars from there. Scan your device again or use alternative tool to double-check that there is no opportunity for cyber infection repetition. Here, look for FileRepMetagen or any other recently installed suspicious programs. When in the new window, check Delete personal settings and select Reset again to complete FileRepMetagen removal. Once these steps are finished, FileRepMetagen should be removed from your Microsoft Edge browser. Here, select FileRepMetagen and other questionable plugins. Click Remove to delete these entries. Now you will see Reset Firefox to its default state message with Reset Firefox button. Click this button for several times and complete FileRepMetagen removal. Here, select FileRepMetagen and other malicious plugins and select trash icon to delete these entries. Click Reset to confirm this action and complete FileRepMetagen removal. Here, select Extensions and look for FileRepMetagen or other suspicious entries. Click on the Uninstall button to get rid each of them. Now you will see a detailed dialog window filled with reset options. All of those options are usually checked, but you can specify which of them you want to reset. Click the Reset button to complete FileRepMetagen removal process. ^ Margaret Rouse. PUP. Techtarget. Search security. ^ e751ffc9052c6011b145d468291c7079e079a4455bf767f77070ccc374ffd0dd. Virus Total. File scanning service. ^ Tim Fisher. Non (Personally Identifiable Information) PII Data. LatentView. Analytics site. 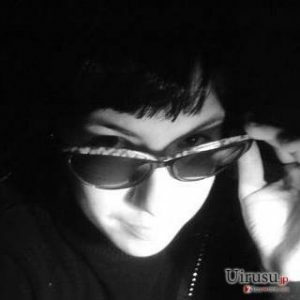 This entry was posted on 2019-04-01 at 04:53 and is filed under Adware, Viruses. You can quickly scan the QR code with your mobile device and have FileRepMetagen manual removal instructions right in your pocket. How did you remove FileRepMetagen?